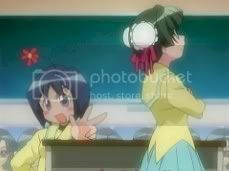 11 year old genius Miyamoto Rebecca aka Becky becomes the form teacher of Class 1-C of Momotsuki Gakuen ... however that class is ... uh full of weirdos? LoL! Actually only 6 of them. Ichijou-san, the self-proclaim class representative [She's the one that got hurlled [middle one la!] away in screenshot 5.] is a whacky one lol, she's pretty 'dense' and weird. Katagiri Himeko, the Ahoge lol, she's the one with the ahoge [A long strand of hair on her head in screenshot 5 [At the bottom]] She's the OMEGA hyper one lol, that is unless u pull out her ahoge then she goes mushy and restless LoL. Momose Kurumi, the plain one, [She's the one with light brown hair hurlling Ichijou-san away in screenshot 5] lol she's probably the only normal one ... but too normal lol. Rokugo-san, uh the ... number 6-san? LoL, nothing much about her yet ... yeah. [She's the one with blue hair in screenshot 5] Uehara Miyako, the study bug, lol [She's the one with orange hair with red spects in screenshot 5] haha she got a really shiny forehead ... a deko-chan? ... XP. Lastly, Tachibana Rei, [WOOO MY FAVE! LOL, She's the one with long black hair, wears spects and making this 'HAIL HITLER' thingy LOL] wahhh she's the BEST lol, i like her alot [Cos she got red eyes XP] She likes to bully Becky hahaha then after bullying her tries to win her back by giving her sweets and saying sweet things lol. She's really funny and cool, one of my fave seiyuu's doing her voice, yeah Satsuki Yukino, seiyuu for Kaname of FMP, Kagome of Inuyasha and Mutsumi of Love Hina. Actually the seiyuu cast is rather good! 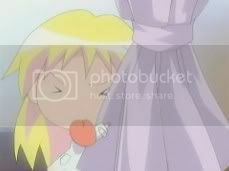 Like Becky's seiyuu's Chiwa Saito, the one doing Hazuki from Tsukuyomi Moon Phase lol, i love it when she saying 'Baka!' hahaha so cute! Yui Horie as Miyako ... hm it don't really suit her at all hahaa, probably the previous characters i listen like she always play those cute cute, violent type girls [Naru? Eri?] lol, not this 'easily-bullied' characters XP, oh i never heard her voice as Torhu in Fruits Basket before so i don't have that 'feeling' LoL. Story: ... Does it even have a storyline in the first place?! LOL Ok, it's probably 6/10? Yeah worth the watch for laughs! Lebar ... yea it was ok. Oh then it was raining so freaking hard on wednesday when i went to rehearse for our presentation ... manz, then everyone's late. Feeling a little pissed lor. Today also. Bleh. No point it's over le. Anyways cya! becky sure is cute when she gets bullied by her students. haha!